Your investments and your accounts are two different concepts. You don’t “buy” an IRA. Your IRA is an account, a container. Your mutual funds, ETFs, CDs, and so on are your investments. You buy investments inside the container. Likewise, who manages your investments and who manages your accounts are also two different concepts. Doing the job well requires completely different competencies. Too many people confuse the two. They let the selection of one drive the selection of the other. Managing investments at the mutual fund or ETF level means buying and selling securities within the fund or ETF. In an index fund or ETF, the crucial parts are keeping the expenses low and tracking the index well. In an actively managed fund, it’s about picking the right stocks or bonds, buying and selling at the right times, and managing risk. These are jobs for investment professionals. Managing accounts is largely an IT function and a customer service function. It’s about keeping the customers’ transactional records straight, maintaining security, issuing accurate statements and tax forms, having a good website for customer self-servicing, short wait times when customers need human assistance, and well-trained customer service reps giving correct answers. These are jobs for IT and customer service professionals. These two areas of competency don’t have much overlap. A company can have great investment managers but poor IT function and poor customer service. Or a company can have state-of-the-art IT and great customer service but horrible investments. Doing well in one does not automatically lead to doing well in the other. If you are impressed by the attentive service given to you by a full service broker, it would be a big mistake to go along with the expensive funds that take more risk and underperform. On the other hand, it can be very frustrating if you go with a company that does very well in managing investments but you get your transactions and tax records all screwed up. When I was doing a year-end summary of my investments, I noticed something about the two major companies I use — Vanguard and Fidelity. Long-time readers know I’m a fan of Vanguard. In terms of who manages my investments, Vanguard dominates. 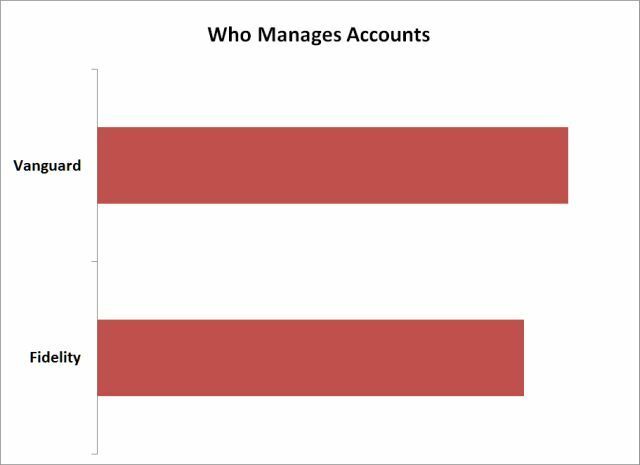 In terms of who manages my accounts, however, Vanguard and Fidelity are more neck and neck. I have about the same amount of money in Vanguard accounts as I do in Fidelity accounts. ETFs allow the separation between managing investments and managing accounts. The ETF managers just focus on managing the ETFs. They don’t interact with retail investors. The brokerage firms just focus on servicing the retail investors’ accounts. They don’t mess with managing the ETFs. You can have Vanguard manage your investments but someone else manage your accounts. You don’t have to invest in Fidelity funds in Fidelity accounts. You get the best of both worlds when you use companies for their strongest competency. Buying and selling Vanguard ETFs in a Fidelity account costs $8 for each trade. I paid a total of $34 in commissions and fees to Fidelity in 2015. I consider it a fair price for the services I received. Fidelity isn’t the only choice. TD Ameritrade offers free trades on more than 100 ETFs, 32 of which are from Vanguard. With the right setup at Merrill Edge, you get free trades on practically any ETF. Those who use a fee-only advisor already have a setup like this. 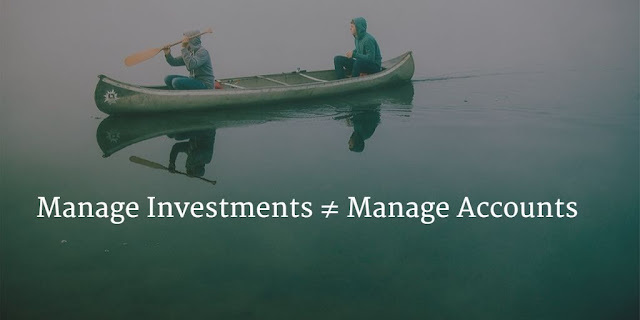 The advisor manages the investments at the portfolio level. A custodian manages the accounts. Mutual fund and ETF managers manage the investments at the fund level. They each play a role they do best. Hello Harry. Thanks to your excellent article a while back about how to open a Merrill Edge account (for a big bonus) plus open a BofA checking account, I am now a “Preferred Rewards Platinum Honors” customer with free ETF trades. (All my Merrill Edge funds are in Vanguard ETF’s) Plus (per your advice) I’m getting 2.62% on the BofA Travel Rewards credit card, transferring the points to my Fidelity account. Question… Now that Fidelity is discontinuing its FIA card, that puts an end to the idea of moving the “Worldpoints” to Fidelity. I was wondering what you will be doing, or are you no longer using that mechanism? I continue to favor that 2.62% because it applies to ALL of my purchases. I do see one possible solution: BofA has another WorldPoints card in partnership with AICPA. I already have the AICPA Cash rewards Visa, but I see they also have an AICPA WorldPoints Visa. Thanks much for all your great sleuthing… and great advice. Anita – See comments and replies on the other article. Thanks for the link, Harry. I didn’t realize there were recent comments on that post that addresses the recent disconnect between Fidelity and FIA. Another data point about holding a Vanguard fund with another “custodian”. I recently opened a Schwab IRA, to earn a $100 “referral” bonus for investing $10,000. In convo#1 with Schwab, I said I wanted to invest a Vanguard mutual fund. The CSR said “Sorry, we cannot buy Vanguard funds. We’re competitors, you know (she laughs)”. This didn’t sound right. So I called and I talked to another CSR who said I’d been given wrong info. True, Schwab cannot “BUY” Vanguard funds, but they can “HOLD” them. So I did a “partial transfer in kind” of shares of the Vanguard mutual fund VBTLX from Merrill Edge to Schwab. Also, in my case, Schwab would reinvest the dividends without transaction costs. Since Schwab charges to buy funds, but not to sell, there is not fee if you sell after transferring funds in. I’ve come to the conclusion that most brokerage accounts are about equal. So, I am ok with Fidelity, Vanguard, Merrill Edge, TD or Schwab as containers for my investments. I buy and sell very infrequently. I’m indifferent as to who holds my investments. This allows me to move Investments from one container to another and collect the promotional bonus. For example, I moved index funds from Fidelity and Vanguard to Schwab. Schwab paid me for doing the transfer. I can at a later date move it again. There is one exception to my saying the containers are equal – trading costs are not equal. Those investments I will be trading get positioned to where the cost is zero. Please explain further as I assumed you would be in index funds in both. Tommy T – When I buy a Vanguard ETF in a Fidelity account, it counts as Vanguard managing the investment and Fidelity managing the account. 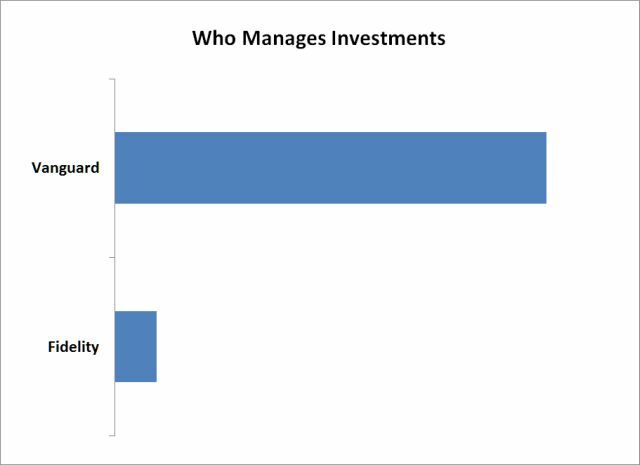 When all my investments are added up this way, in terms of who manages the investment funds, Vanguard dominates. I had read the charts as if Harry was evaluating Vanguard and Fidelity. The charts are apparently just were Harry’ volume numbers.